Murphy’s Law has come to fore again. Here I was thinking the seat foam from the Holden dealer would do the job and overcome our issue with one of the front seats. Wrong. I went and picked it up, took it up to the trimmers and of course it was the wrong one. Back to the dealer looking for an exchange only to be told the VZ had been superseded by the one I had in the box. The trouble with the one I had was it does not have the Velcro strips in the foam. The seat cover is glued to the foam which renders it totally useless. So on an ugly traffic Thursday I head out to Smithfield having wasted four days of running around and spent the next three hours cursing everyone on the road. Thankfully I got a seat, it looked like the right one and clearly had Velcro strips. Back at the trimmers we pull it apart and sure enough the Velcro strips are there and the foam is perfect. The first warning sign was a electronic pad on the seat foam for a seat belt light. The VZ did not have these. The following day I get a call from Duncan and sure enough the foam is different. It obviously came out of a newer Commodore and instead of being straight on the sides it was curved. Duncan spent numerous hours massaging the foam, at my expense. Bugger. 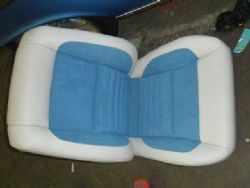 It was finally massaged into shape and the front seat covers have been done. 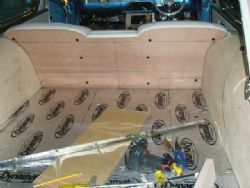 Bendy ply has been used to cover the rear wells and the rear seat belts have been installed. Not without drama, of course. 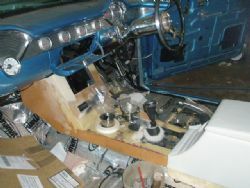 It turns out the rear seat belt retractor mechanism were mounted horizontally on the wheel arch. We only had one that worked, out of a Falcon. Off to the wreckers again and third time lucky in Brookvale I sourced one at the right price and it is now fitted in place. The rear belts come out level with top of the seat and retract when not used which is a better option than the original belt hanging down over the rear windows. The carpet has been sourced and amazingly arrived with no dramas. 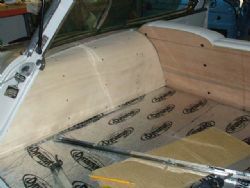 The entire rear cargo area, tailgate and wheel arches will be covered in carpet. We ummed and aahed over using leather in parts, what other options there were and decided to just go carpet everywhere. The carpet is a light grey and should complement the other colours of the interior.